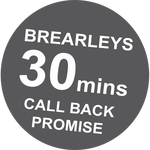 We recognise that buying, selling and dealing with property related matters generally is a stressful experience so at Brearleys we aim to provide you with a friendly and efficient service to ensure that any transaction is pushed through as quickly as possible with a minimum of fuss. We are part of the Law Society ‘s Conveyancing Quality Scheme which shows that we implement the highest service standards. As most of our services in this area are fixed fee it will also allow you to be able to budget for exactly how much the process will cost you.